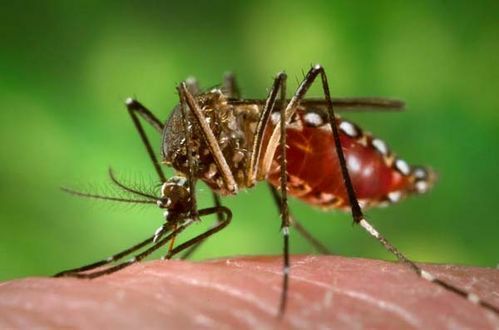 The yellow fever mosquito (Aedes aegypti) is a mosquito that can spread dengue fever, chikungunya, and yellow fever viruses, and other diseases. The mosquito can be recognized by white markings on its legs and a marking in the form of a lyre on the thorax. The mosquito originated in Africa but is now found in tropical and subtropical regions throughout the world. Aedes aegypti is a vector for transmitting several tropical fevers. Only the female bites for blood, which she needs to mature her eggs. To find a host, these mosquitoes are attracted to chemical compounds emitted by mammals. These compounds include ammonia, carbon dioxide, lactic acid, and octenol. Scientists at the Agricultural Research Service have studied the specific chemical structure of octenol to better understand why this chemical attracts the mosquito to its host. They found the mosquito has a preference for “right-handed” (dextrorotatory) octenol molecules. The yellow fever mosquito can also contribute to the spread of reticulum cell sarcoma among Syrian hamsters. The Dengue Mosquito is a pest mosquito and can be a carrier of Dengue fever, Yellow fever, Murray Valley encephalitis and Ross River virus. The female mosquito is dark coloured with white markings on the back and white bands on the legs. The thorax is dark with a lighter curved marking on each side and two light stripes running down the centre. The Dengue Mosquito is an introduced species found in Queensland, and has also been known in Western Australia, Northern Territory and southern New South Wales.